Nostalgia, Norman Rockwell, and . . . Donald Trump? Norman Rockwell’s “The Connoisseur” is the key piece in the new exhibit. STOCKBRIDGE — Is America going through a Rockwellian moment? Not really. Ours is a harder, darker, more brittle era. But it’s certainly an interesting time, socially, politically, and maybe even aesthetically, to be talking about Norman Rockwell. The great illustrator spent a lifetime inventing pictorial fictions that many Americans like to think of as a collective national mirror. But Rockwell’s pictures are in a more dynamic relationship with America than the mirror metaphor suggests. They evoke instead the relationship between Dorian Gray and his ghastly, deteriorating portrait in Oscar Wilde’s famous novel. Only now, the terms are reversed: The real America ages dreadfully – silted up with failed ideals, ravaged by moral wrong turns – while Rockwell’s clear-running, tenderly lit, endlessly young and forgiving world taunts us with its refusal to change. But that’s in the nature of pictures, isn’t it? They don’t change. Aesthetic fashions, on the other hand, do. And Rockwell was acutely aware of the fact. 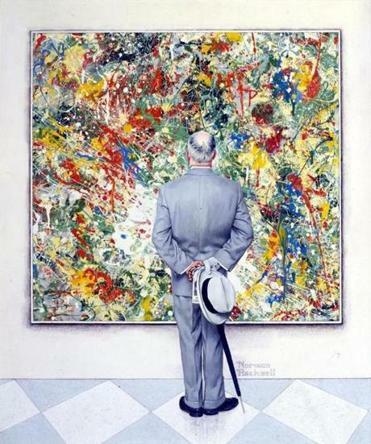 He demonstrated his awareness, with typical slyness and humor, in a celebrated painting called “The Connoisseur.” It shows, from behind, an old-fashioned man in a silver suit staring at a parti-colored abstract painting in the drip-and-splatter mode of Jackson Pollock. In Rockwell’s painting, the man’s stance is symmetrical, uptight. He carries his hat, gloves, and tightly furled umbrella in hands clasped formally behind his back. He represents order. Order and the past. The painting, with its tangled splatter lines and arbitrary colors, represents chaos. Also, self-evidently, the new. “The Connoisseur” is the key work in “Rockwell and Realism in an Abstract World” at the Norman Rockwell Museum. The exhibition places examples of Rockwell’s narrative realism — paintings tailored to appeal to a national audience through the medium of mass-circulation magazines — alongside a sampling of artists affiliated with postwar avant-garde art movements, from Abstract Expressionism through Pop and Photorealism. The idea behind the show is great. The reality is disappointing. There are too many works and too much explanatory text. The display is a jumble with no cogent through-line. Worst of all, most of the modernist works by Pollock, Jasper Johns, Cy Twombly, and others of their ilk are unremarkable works on paper. Anyone coming upon these artists for the first time could be forgiven for concluding that they were timid doodlers, while Rockwell was an Olympian god. Nonetheless, following the lead of Solomon’s biography, the show does try to usher in a more nuanced idea of postwar American art and culture. And in this very weird national moment, when the idea of progress has been hopelessly entangled with nostalgia, and politics is mired in mutual hostility, the effort feels worthwhile. Just as “The Connoisseur” wittily combines two styles of painting in a single image, the exhibition as a whole aims to bring two apparently contradictory sources of American cultural pride into the same space. There is the pride any American might take in Rockwell’s vision, rooted as it is in pluckiness, humor, compassion, and character. And there is the pride Americans might equally take in the achievements of Pollock, de Kooning, and their various successors in the avant-garde. 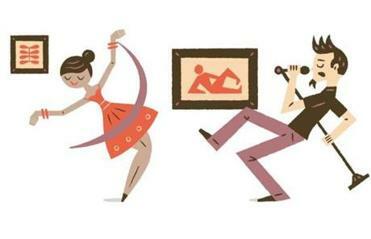 Those artists, don’t forget, were responsible for invigorating American culture in the postwar era. They succeeded to such an extent that art’s center of gravity shifted from Europe to America. Their achievements were admired and emulated the world over. In one sense, Rockwell’s “The Connoisseur” is a bittersweet acknowledgment of this success. For all his renown, Rockwell was wistful about his own status (in the art world, at least) as a mere illustrator whose true feelings had to be subordinated to the demands of each new commission. He resented, for instance, having to make Richard Nixon look congenial — but he did it. He knew his style of narrative painting was already old hat, and that he was in danger of becoming a relic — just like the connoisseur in the picture. He admitted that, had he still been young, he would probably have painted like the Abstract Expressionists. So is the painting a joke on himself? Possibly. But it could also be taken more straightforwardly as a mockery both of abstract art and aficionados of fine art; a suggestion that only a pretentious connoisseur could look at a tangle of splattered lines and take it seriously as art. 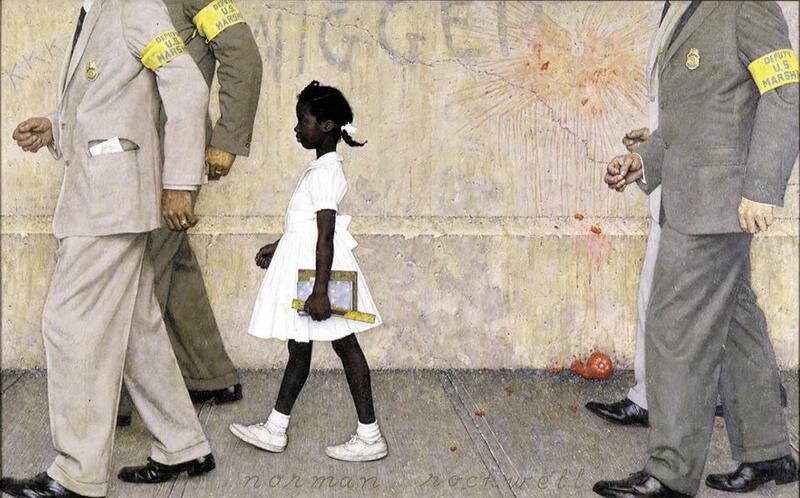 There is no correct interpretation, which is part of the genius of Rockwell. He was able to tell visually compelling stories that appeared simple, but were in fact open-ended, and charged with complication. I often see this side of Rockwell and admire it. But then I fall back on my real feelings about him — that no matter how much I admire the technical skill, the wit, and the exuberance in so many individual pictures, I also find most of it cheesy — cheesy in the sense that it is deliberately playing to the crowd. That’s not a major criticism: Rockwell was, after all, an illustrator for mass-circulation magazines. Politicians, who also say cheesy things as they play to the crowd, know that the easiest way to succeed is to let nostalgia and sentimentality overwhelm honesty. Of course, to be modern is to understand the importance of being on guard against nostalgia. Any image that elicits a response along the lines of “Ah yes, this is how it was!” is just a sigh away from “This is how it should be again!” And in this unconscious, backward-groping motion of the mind, which Rockwell makes it very hard to resist, it’s easy to recognize a dominant urge in today’s politics. The urge is not simply to “Make America great again!” but to restore us to innocence: to the days when a family would pause to say grace before a meal, even in a busy restaurant. To a time when an image of a boy revealing his bare backside to an older man (a doctor) did not have to carry any sinister overtone. To a world where a policeman could meet a runaway boy in a diner and gently persuade him to return to his mom and dad. Donald Trump is hardly the first presidential candidate to come up with some version of “Make America great again.” If you are running for office, restorative, nostalgic sentiments of one kind or another are pretty much obligatory. Ask Bernie Sanders. But whichever nostalgic vision wins the day, it somehow never leads back to innocence, does it? “The Problem We All Live With,” a 1963 work by Norman Rockwell. Rockwell himself was hard to pin down politically. He looks conservative to our eyes, but he claimed always to be an independent voter. Like many Americans, both conservative and progressive, he was against racism, he was egalitarian, he was for community. I suspect Trump’s divisive rhetoric would have appalled him. Trump’s belligerent, hard-edged politics are a world away from Rockwell’s soft-edged nostalgia. But I think the gap between the two is quantitative, not qualitative. His success is a measure of people’s frustration and anger. Why can’t America restore itself to greatness? Why can’t we find our way back to innocence? Like Dorian Gray staring at his portrait, we keep looking into Rockwell’s “American mirror,” beguiled by the gap between fiction and reality, horrified by our own handiwork. If Rockwellian nostalgia is, in fact, dangerous, and linked to authoritarianism (no one believed this, by the way, more than Clement Greenberg, the leftist critic and loather of all things “kitsch” who helped make Pollock famous) must we all become self-consciously modern to fight against it? Must we, if we wish to avoid pandering to reactionary, fear-based politics, be early adopters not only of new social mores and technologies but new art and new aesthetic philosophies, too? Somehow, I don’t think so. Actually, I think it’s vital not to confuse being progressive in art with being progressive in politics. They are not at all the same thing. In my experience, mediocre artists are all on the same page politically (the progressive left), whereas the great, mold-breaking ones are, frankly, all over the map. What we do need (and I don’t know how to make this sound other than toxically bland) is a willingness to admit complication. We need, in politics, to be able to see virtue in conservative values (there is so much worth conserving) even as we recognize the need to change, to improve, to move on. In art, in the same way, we should be able, if we please, to admire both Rockwell and Pollock; both Andy Wyeth and Andy Warhol. I am not calling for indiscriminate love and acceptance. Just a willingness to value honesty over ideology, and subtle distinctions over group-think. 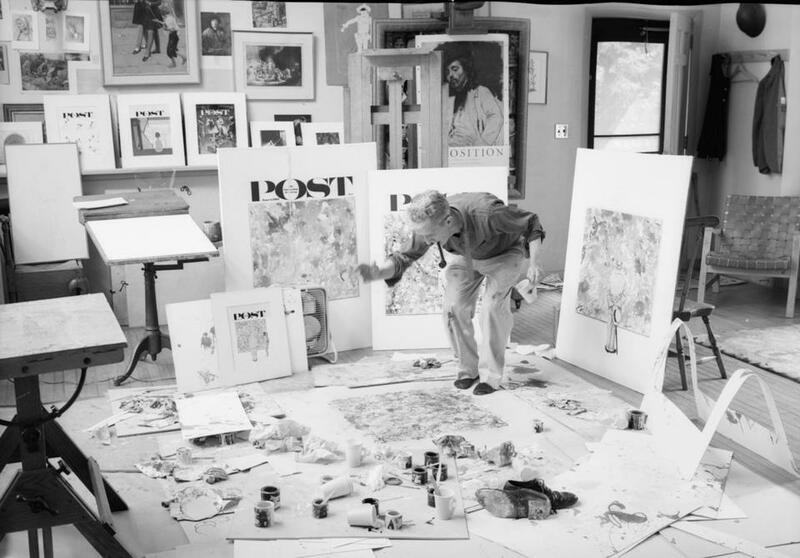 Norman Rockwell working on “The Connoisseur” in 1962.